Ready for a break from the 'shop' posts? Me too. I love sharing crafting tutorials with you all and am sorry I haven't done too many as of late. I hope to be better at sharing tutorials and some of the other projects I've been working on. Yes. You can cut fabric with your Cricut. No. It won't make your machine blow up. But yes, there are some tricks that make it a little easier. 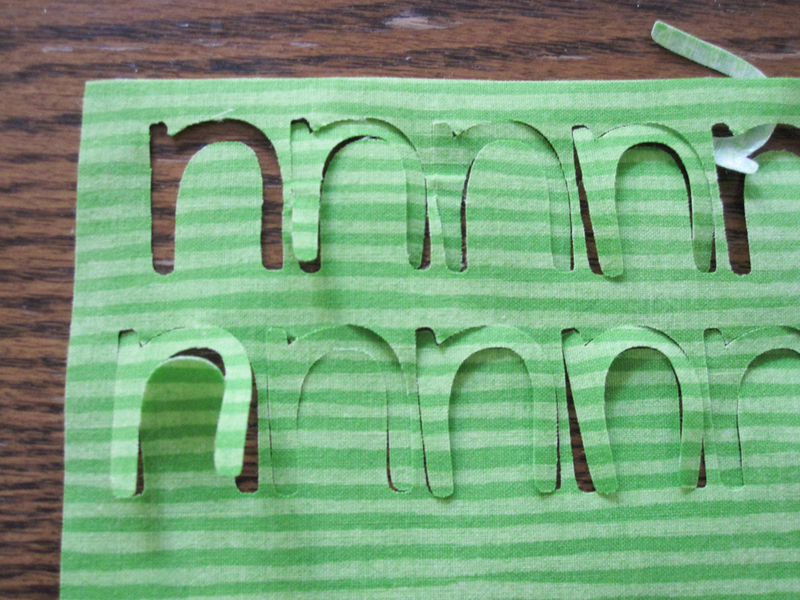 So after cutting many a lettering kits I thought I'd share how I cut fabric with the Cricut. Heat n' Bond Ultrahold (red package) I'm not affiliated with Heat n' Bond, or Cricut for that matter, neither know I exist. Heat n' Bond is the brand that has given me the best results. 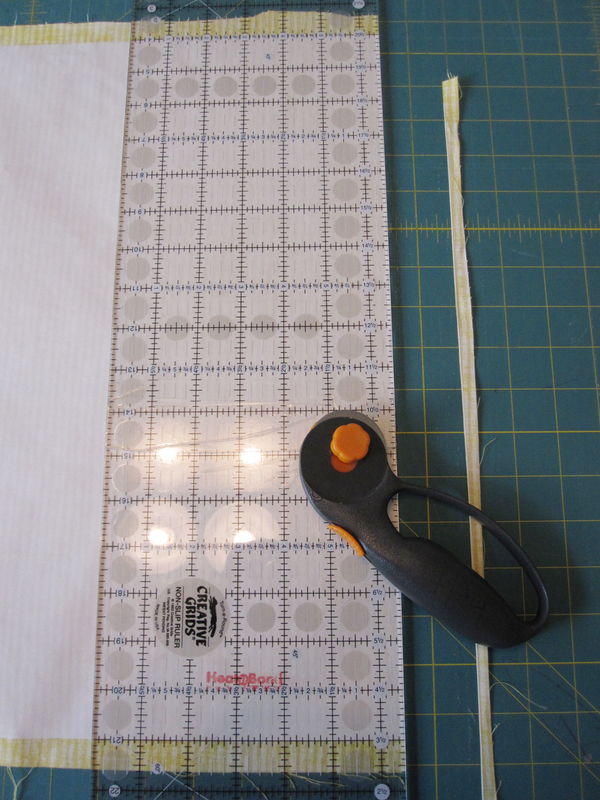 No, you don't need to sew after using this fusible webbing. Don't use Heat n' Bond Lite (purple package) with the Cricut. I've tried it with the Cricut and haven't had good results. 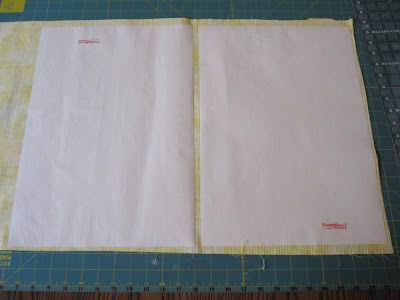 However, I use it all the time when I need a sewable or light-weight fusible fusible webbing. It is still a great product. You can buy Heat n Bond in 1 yard packs or 5 yard packs. I usually buy my Heat n' Bond at JoAnn's when the notions are 50% off or BOGO. That way it is only about $5.00 each instead of $10.00 each for a 5 yard roll. Edit 2/2014: JoAnn's no longer offers Heat n' Bond in the 5 yard packs. However, you can get the 5 yard packs at Walmart in the sewing section for about $7.99 or $8.99. Fabric - the amount you need depends on your project. For this project I used 1/2 yard cuts of fabric. I haven't had the best results when I use CHEAP CHEAP fabric, think the FQs at JoAnn's. I've had great results with the stripes, polka dots, and vine fabrics from JoAnn's Keepsake Calicos. (see the title picture above for examples) Designer fabric cuts perfectly. Iron - I bought a cheap iron from Walmart that I use for projects that use fusible webbing/interfacing. This is totally optional, but I ruined the nice iron we got as a wedding gift from such projects. When cutting fabric with my Cricut, I only prewash my fabric if I am going to wash the finished product. If you prewash your fabric, don't dry with fabric softener. After washing, iron with heavy starch. 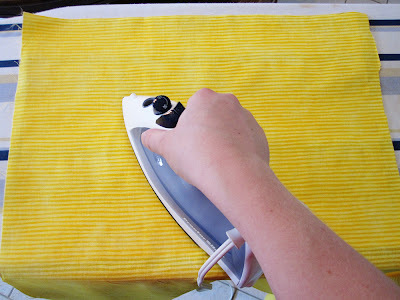 You want your fabric to be as crisp and smooth as possible. The starch helps bring back some of that sheen and smoothness you get with not washed fabric. You don't need to make the fabric super stiff, so just a little is fine. 1. 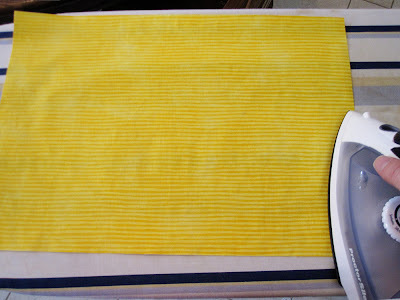 Press your fabric well, very well. 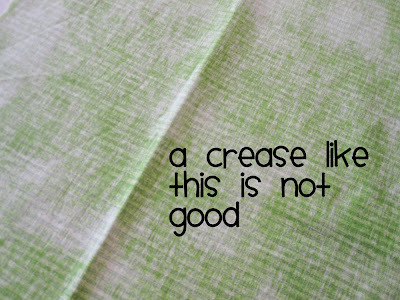 You don't want wrinkles or creases at all. Use water or steam to get all wrinkles and creases out. 2. Cut the Heat n' Bond to your desired size. 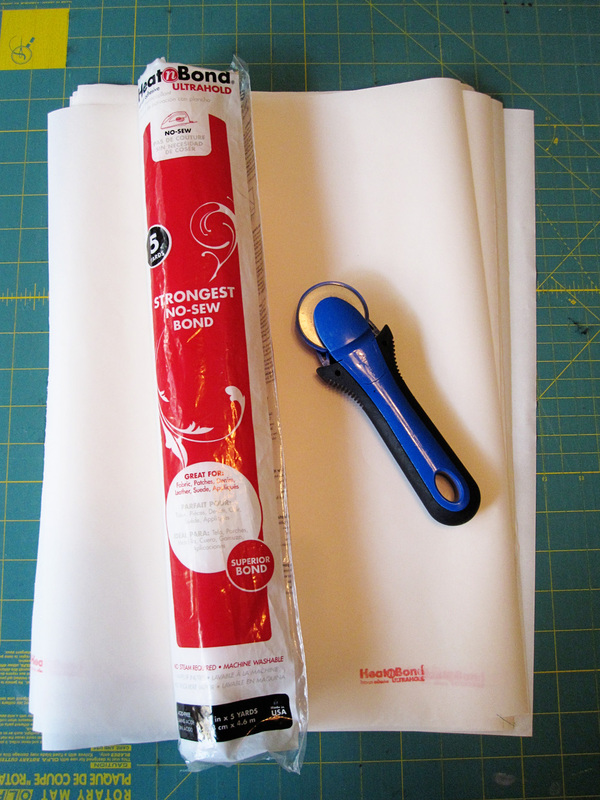 I made 'sheets' of fabric for this project so I cut my Heat n' Bond into 12"x17" sheets. The length is 17" because that is the width of the Heat n ' Bond. 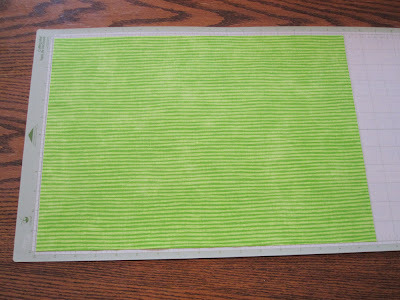 I have the 12" x 24" mats so I could make my sheets larger than 12"x12". 4. Flip over the fabric to the right side and press well. The webbing has to be fully-adhered to the fabric or you will not get a good cut. 6. Again, I like making sure the webbing is fully adhered, especially around the edges. So I just quickly go around the edges with the iron after I've trimmed down my sheets. 7. Now you are ready to cut! I like to prepare all my fabric at once if I am doing a big project, like the lettering kits. So if it has been a few days since adhering the webbing, I will quickly give the sheet a quick iron before placing it on the mat. Totally optional, but it just makes me feel better. Place the sheet on the mat and smooth well with your hands. Cut as desired! I set my pressure to high, blade depth to 5, and speed to slow. You may want to practice on a scrap of fabric with webbing just to see what works best with your fabric and machine. 8. If you are cutting small and intricate shapes/letters there may be a few places where a thread of fabric is holding shape/letter onto the sheet of fabric. Most of the time I can just give the shape/letter a tug and it comes right off the sheet of fabric. Sometimes though, I have to get out my little applique scissors and trim a thread or two. I only have this happen with SMALL letters/shapes. I've NEVER had this happen with larger shapes. Larger shapes separate from the sheet of fabric just like when you are cutting paper. 9. Adhere your letters/shapes to your project following the package directions. 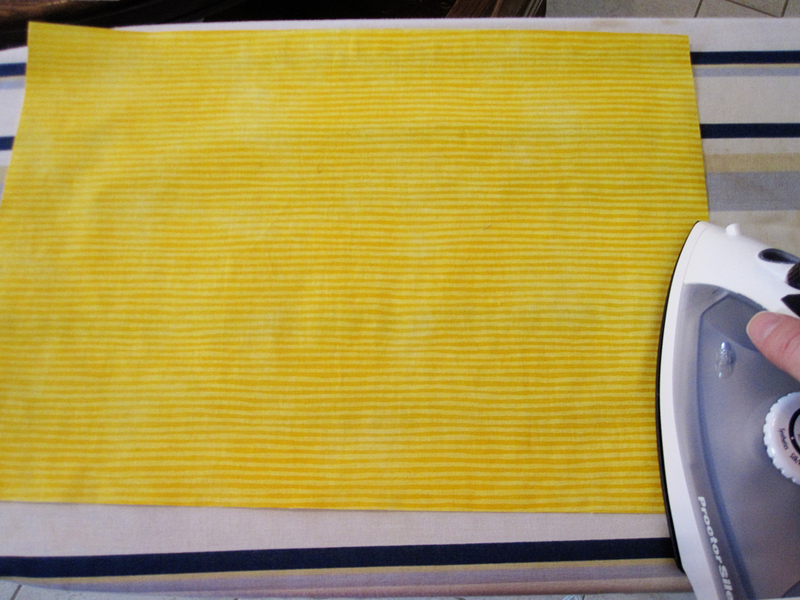 If I am adhering to felt, I always use a pressing cloth between the project and my iron. This is because you use a higher temp on your iron to adhere the letter then you would want to use with felt. And yes, felt can and DOES melt...I know from experience. Again, you don't need to sew to reinforce this type of fusible webbing. (That is from the manufacturer, not me.) I've heard you can gum up your needle if you do, my mother's experience. 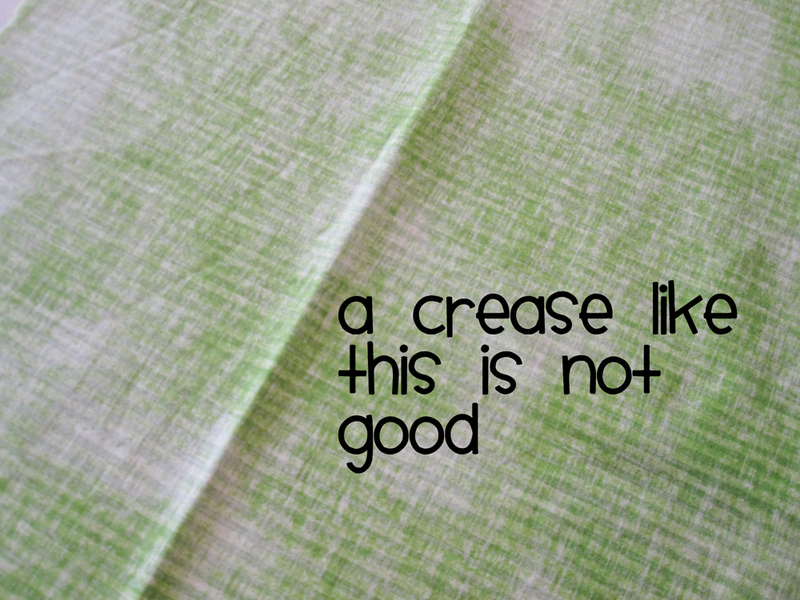 I did try it on my machine and it sewed fine but it isn't something I do regularly. Therefore, I am not going to give you the go to try it on your nice sewing machine. 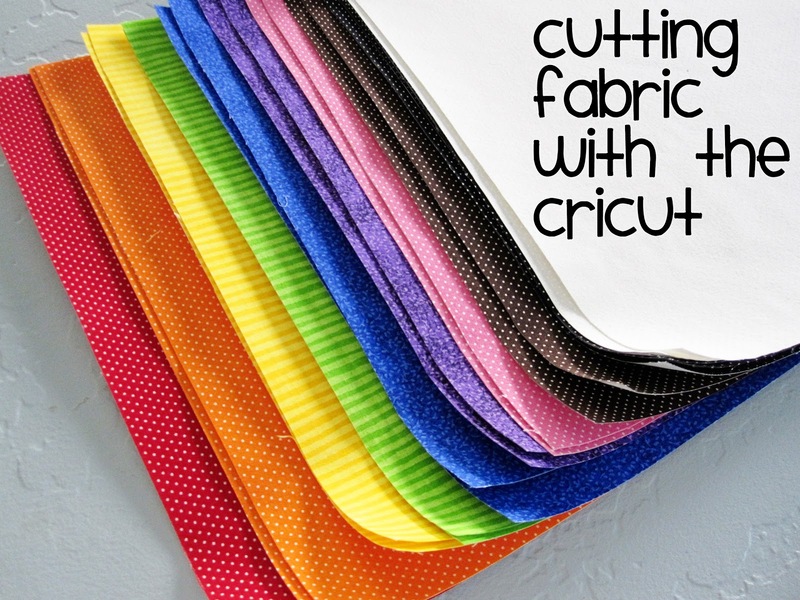 Hope this helps anyone out there attempting to cut fabric with your Cricut. It really opens up so many possibilities for fabric! Love it! This is just how i do it too. I have used the lite (that is what I used on the classroom set of zipper pouches I just finished) but, you are right, it does not cut quite as good. I never thought about using a new blade, but I borrow my friend's cricut to do it and always bring my own blade, so that is probably why it works good...it isn't used as much :) I am really wanting to make your colors book. I am thinking of getting a group of friends together to do it. Thank you so much for that! I have been having the hardest time cutting fabric with my cricut and it has been driving me crazy! The key is definitely a different blade. I will be trying that right now. funny, I am the friend who's Cricut Tasha uses. :) I love the my cricut can cut fabric! I agree its a good idea to have a blade only for fabric. Thanks for the info. I bought my Cricut to mainly do fabric but have not done it yet. Maybe this will be a big help. Any info you can provide would be a big help. 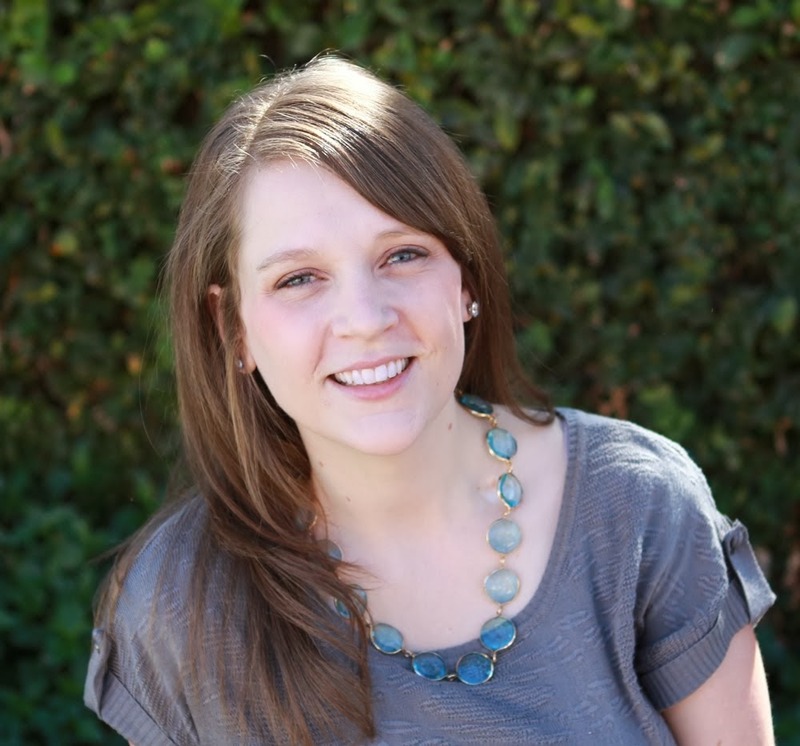 Thank you for sharing this post! I have always wanted to cut fabric with my cricut! i have used heat n bond on paper as well and it works really nice esp with letters. as you will be able to tell which side is the right side up. Your tutorial really,really helped me with a project that I'm working on. Thank you so much for sharing this tutorial. Thank you so much for sharing this tutorial. It has helped me so much with a project that I am working on. Thank you SO much for this tutorial! I've had my Cricut for a few years and have always wondered about cutting fabric with it. I will definitely be trying this! Yay! My crafting buddy and I were trying to cut some letters this morning and KNEW about using fusible but failed miserably. Googled & found your instructions, ran to Hancock's for the Ultrahold and made letters galore! Hers for a wall hanging and mine for a pillow. I am off to try to make some critters with my scraps. Thanks so much for your tut! 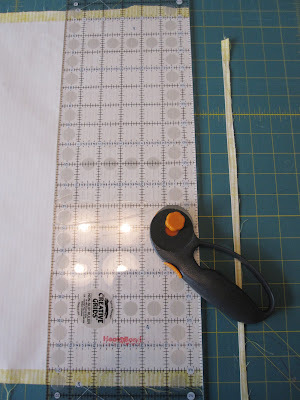 Thank you so much for this post...I had given up trying to use my cricut for cutting fabric...I know now that I just didn't know the best method for accomplishing it. I'm looking forward to it. Forgive me for asking this. I am looking to buy the cricut expression 2 to cut my fabric for quilts. Why do u put the heat n bond stuff for? Thanks for all the comments! Here is an answer to a question. 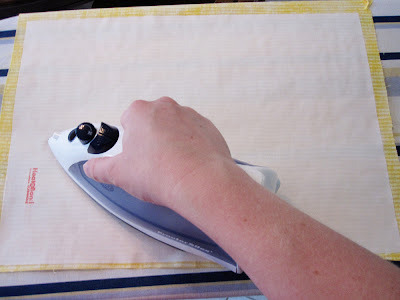 Heat n' Bond is used to stabilize and add adhesive to the back of the fabric so you can adhere the fabric. You can't just put fabric on a Cricut mat and cut like a piece of paper. Also it is important to note that you want to use Heat n' Bond Ultrahold. The Heat n' Bond Lite doesn't add enough stability for it to be cut. I've never cut felt with the Cricut so I can't really help you out. You could try a google search for cutting felt with the Cricut and see how that helps. Thank you so much! I just recently bought a silhouette and trying to cut out letters and have had so many errors. I didn't know what was the best fabric or fusable bonding. If the letters are really small and you want it to be permanent on a child's t-shirt what is the best heat bonding, because it will be washed? As far as the Heat n' Bond brand, Ultrahold is the type you want to use if the item is going to be washed. (The other type of Heat ' Bond is Lite.) Ultrahold is the only kind that I use when cutting with the Cricut. However, I don't know what brand Silhouette recommends. So maybe check that out too. Does anyone know if the Expression can cut plush material? It already has a fairly stable backing that's no thicker than a medium-weight cotton weave and not as dense. The cutter wouldn't be cutting the plush fibers themselves, although I'm concerned that some plush fibers might come loose and wind up somewhere in the Cricut mechanism (but I will check and clean out anything that might be loose). I'm mostly looking to cut simple 1 ~ 4-inch diameter circles and similar-sized leaves (the latter may wind up being made from felt since they have serrated edges). Thank you! off to try your method right now - fingers crossed!!! Thank you for the tutorial ...success!!! I hand cut all my applique letters and shapes this way because I never could get my cricut to work right. I will be trying your tips tomorrow night! Thanks! I have tried countless times to cut fabric with my Cricut machines. I have used the tips here as well as others but I have never been successful. The fabric either moves on the mat or doesn't get cut all the way through. Is there something that I’m doing wrong? I am sorry you've had troubles cutting fabric. As for the fabric moving, your mat probably isn't sticky enough. You may want to try a new mat or re-sticky it yourself using repositionable adhesive. (There are lots of tutorials online for doing this.) If you are not having deep enough of a cut, you need to adjust your settings. If I am not getting a good cut I just set my depth to the deepest and pressure to the max. I don't have all the answers, just what has worked for me. I hope that helps! 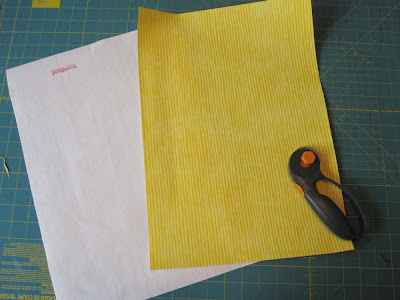 Once you have fused your fabric and ready to place on your mat, do you remove the heat and bond paper first or after you have cut the fabric? I leave it on, but others have removed the backing and it works great. Probably just personal preference. Thanks for this tutorial! Do you know if this would work with lace? Have you ever attempted? Thanks for this! Getting ready to try with Cricut Explore. Do you use the standard cutting mat or the strong grip? Have you ever tried cutting fabric without the heat & bond? Thanks! Hi! Great tips!! Please recommend a mat - it looks like you're using the standard grip. Also, when cutting with the Cricut explore with the deep cut blade, is there any fraying? I usually cut by hand and apply the bond - I have never used the cricut for fabric. Is there any way to fix fraying? I know nothing about fabrics, I really only work with paper and vinyl, but I have been getting a lot of requests with fabric. Thank you! I am going to be making a grandmothers flower garden quilt using the English Paper Piecing technique. I was hoping to cut out the hundreds of hexagon pieces of paper and fabric using my cricut. I know the paper pieces will be a breeze, but am concerned about the fabric pieces. I am afraid if I use the heat and bond, the fabric will not fold easily around the hexagonal paper pieces and will be difficult to hand stitch. Has anyone used heat and bond on fabric that will be pieced together by hand for a quilt? Thanks so much for this excellent tutorial. I hadn't even thought about printing on fabric but now want to try it. what if i want to make a tiny bag with it from my carts i need to be able to put stuff in..will it be sticky cant i use something else i want to make a treat bag . Can you tell me which cricut you used? I am looking to buy a used cricut but I am not sure which one would be able to cut fabric best. �� Thank you! This post was so helpful, thanks! I have been dying to cut letters and was afraid to try it. What about mats? how many did you go through, do you get new ones or apply spray adhesive to old ones? What about mats? Should I buy new or use spray adhesive?